Hello! I have a couple of fun things to share with you today. A video and a giveaway! Making a card list and checking it twice? Online Card Class instructors Kristina Werner and Jennifer McGuire—and friends—are here to help you send handmade cards to everyone on your list this year. That’s right—it’s time for Holiday Card Workshop 2014! 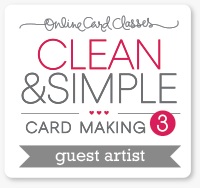 Join us for a very merry class packed with ideas and card-making know-how. 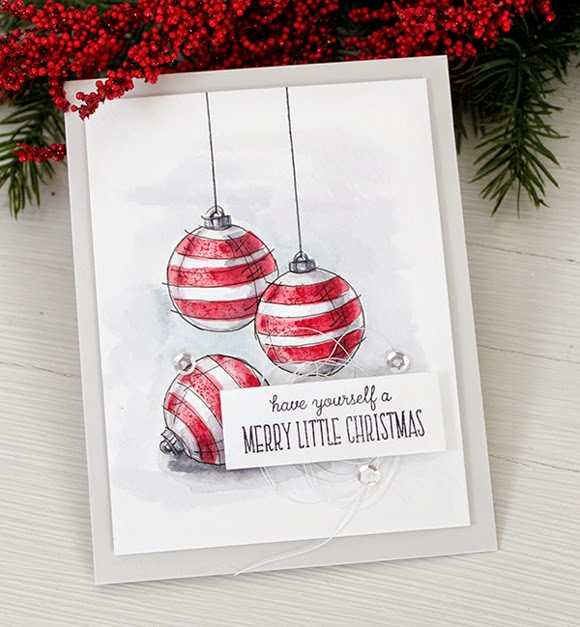 With loads of stamping, die-cutting, layering, coloring, and more showcased in a variety of card styles, you’re sure to walk away inspired for the holidays! All cards will be included in how-to videos... with over 17 in total! I am honored to be one of the guest instructors for this awesome class! And just to get you warmed up, I thought I'd share a how-to video right now for recreating these watercolored ornaments. I apologize in advance for the length of the video. But this was highly requested and I wanted to be sure to pack as much instruction and information as possible in there. Or, if you prefer, I also shared some tips on how to create a looser painting style and adding some extra touches just to switch things up like the card pictured below. 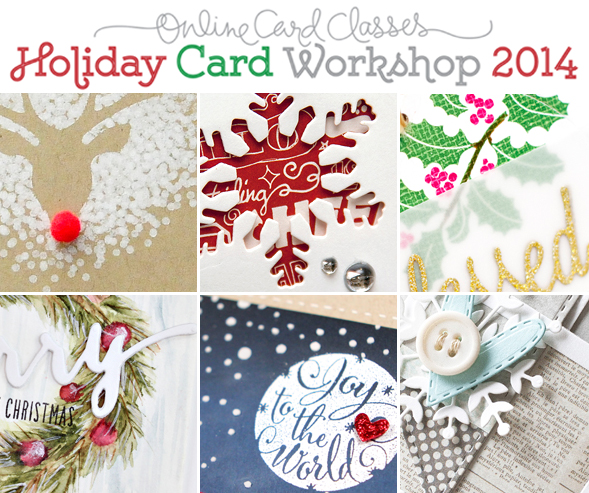 I’m so excited to give away one spot in the Online Card Class Holiday Card Workshop 2014! Will you be the lucky winner? Leave a comment on this post by 11:59 p.m. EST on 11/01/2014 to be eligible! I will select one random winner and post the winner on the blog on 11/02/2014. Class starts on November 3, 2014, and I hope to see you there! Hello! 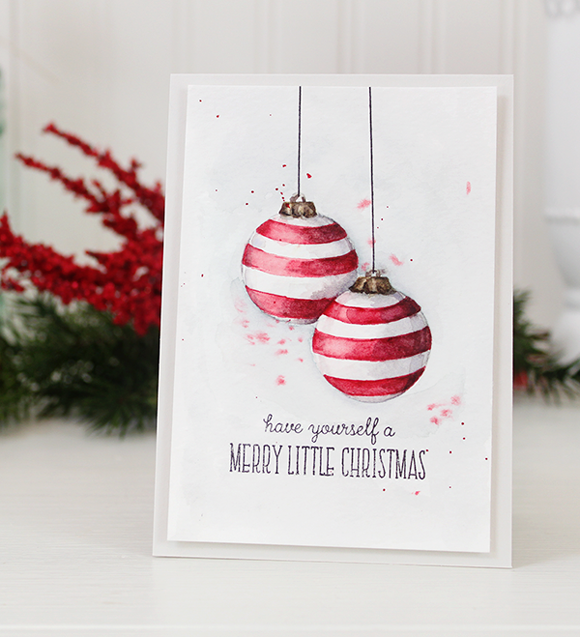 Today I'm sharing one basic design with three different looks all using the Little Bits and Festive Greetings stamp sets. The first card features colored stamping on Kraft cardstock. I used to create with Kraft a lot - I mean A LOT. But I have been really into color lately. By using this technique, I can have the best of both worlds! By stamping the image first in white and then over-stamping the image again in color, I was able to maintain a color more true to the ink. I really loved this simple design, so I decided to try it in a couple different versions as well. The gorgeous color combo of Sweet Nectar, Lake House, and Old Gold looks amazing on white. I heat embossed the sentiment in gold and added a sprinkling of Pretty Pink Posh Sequins to dress it up. Then I wanted to try a more monochromatic color combination. I added pops of silver and gold along with a little twine to this one. I think you could use the other images in Little Bits (hearts for love - stars for birthday - sequins for congratulations) and switch out the sentiments for just about any occasion. Talk about versatile! I'm popping in quickly to share the winner of the Merriest Wishes stamp set. Congratulations Holly Saveur! Please contact me at customerservice@wplus9.com with your address and we will get this shipped right out to you!